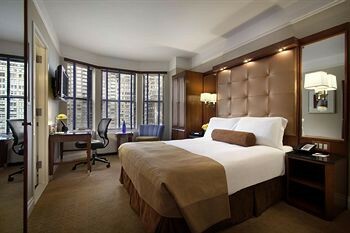 Property Location A stay at Hotel Chandler places you in the heart of New York, walking distance from Empire State Building and Madison Square Park. This 4.5-star hotel is close to Macy&apos;s and Grand Central Terminal.Rooms Make yourself at home in one of the 148 air-conditioned rooms featuring iPod docking stations and minibars. Complimentary wireless Internet access keeps you connected, and cable programming is available for your entertainment. Bathrooms have designer toiletries and complimentary toiletries. Conveniences include phones, as well as safes and desks.Rec, Spa, Premium Amenities Pamper yourself with onsite massages or enjoy recreation amenities such as a fitness center. This Beaux Arts hotel also features complimentary wireless Internet access, concierge services, and a television in the lobby.Dining Quench your thirst with your favorite drink at a bar/lounge. Breakfast is available daily for a fee.Business, Other Amenities Featured amenities include a business center, limo/town car service, and express check-out. Event facilities at this hotel consist of conference space, meeting rooms, and a meeting room.